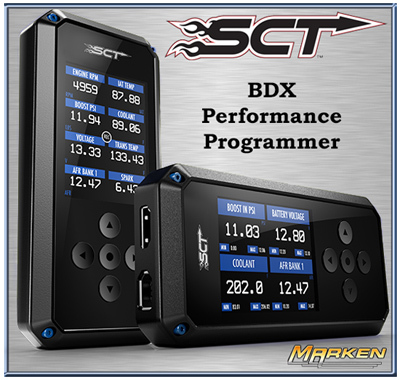 The BDX Performance Programmer via Marken Performance delivers street-tested, dyno-proven tune files developed by SCT’s expert calibrators to unlock each vehicle’s true potential. Its sleek design, full-color display and customizable gauges help track, data log, and adjust powertrain performance to deliver more horsepower and torque when it’s needed most. Select from multiple SCT tuning levels or load up to 20 custom tune files from one of our thousands of custom tuning dealers worldwide. Direct-to device updates and custom tune delivery over WiFi means cables and computers are a thing of the past. A variety of customizable vehicle functions are available such as Monitoring, Data Logging, Reads & Clears DTC Codes, and it stores your vehicles factory tune file for easy restoration back to the stock program. Here's what you can adjust: Axle Ratio, CMCV Delete (Charge Motion Control Valve), Fan Control (Lowers the Temperature at which the Fan turns on), adjust for different sized fuel injectors, addition or removal of timing across all RPM ranges, Idle Adjust, Allows you to select from different aftermarket MAF, Support for Kooks High Flow Y Pipes, Allows adjustment for Longtube headers, selection of available intake kits, Compensates for aftermarket Throttle Bodies (BBK 65/85/90 MM), Throttle Sensitivity, Tire Size, Change or disable the Tire Pressure Monitoring System, Traction Control, Transmission Shift Firmness and Shift points, Enabling the MDS (Multiple Displacement System) initiates a fuel saving 4-cylinder engine mode and disables additional engine cylinders. Features vary for each vehicle and are not available on all vehicles.